From Route 199, turn left at the Las Vegas pachinko/Poplar convenience store, and follow the road up and around. At the next traffic lights (intersecting Route 3), go straight ahead towards the mountains. Take the third road on the right, opposite the yakiniku restaurant KAI. Our offices are immediately on the right-hand side, in the large brown building. From Route 3, you should pass through the Tamukeyama Park tunnel. Turn right at the fourth set of traffic lights (approx 1-2 minutes after the tunnel) towards Fujimatsu, and go straight up towards the mountains. Take the third road on the right, opposite the yakiniku restaurant KAI. Our offices are immediately on the right-hand side, in the large brown building. 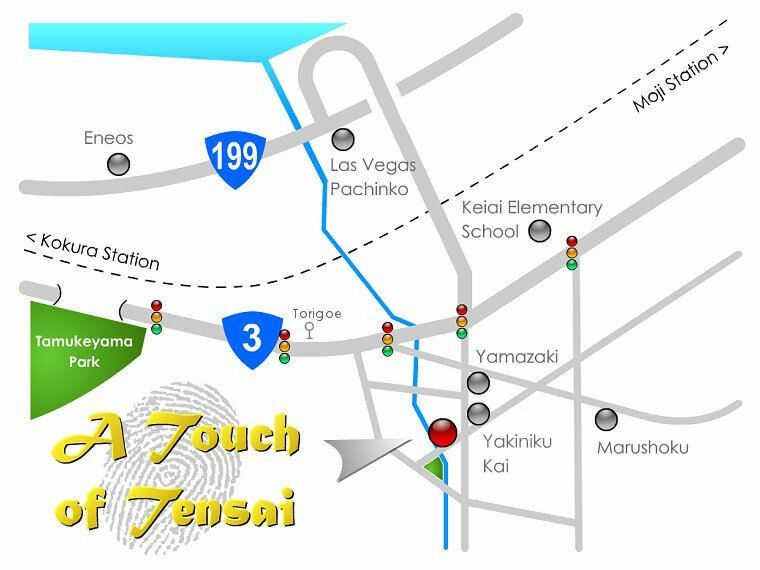 From Route 199, turn right at the Las Vegas pachinko/Poplar convenience store, and follow the road up and around. At the next traffic lights (intersecting Route 3), go straight ahead towards the mountains. Take the third road on the right, opposite the yakiniku restaurant KAI. Our offices are immediately on the right-hand side, in the large brown building. From Route 3, watch for the junction with a large road-bridge curving up to the right towards Route 199. At that junction turn LEFT towards Fujimatsu and go straight up towards the mountains. Take the third road on the right, opposite the yakiniku restaurant KAI. Our offices are immediately on the right-hand side, in the large brown building. Buses 6, 49, 70, 73, 75, 83 and 94 all stop within a three minute walk - get off at Shinmachi (新町) or Torigoe (鳥越).